This stand gives the burner an alternative height great if you are going to use the Burner as cooker as well no more groveling on the floor. Fantastic if you are going to stand the burner next to a table allowing you to stare into those mesmerising flames it also has a handy shelf. 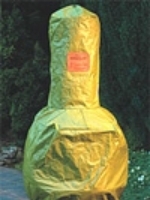 Designed primarily to keep wild and domestic animals out of your Burner The hibernation covers are made from a durable green nylon weave which will assist in keeping the burners dry in the worst weather this means that if you want to use your burner during the wet winter months it will come up to temperature a lot faster. This fantastic little accessory fits into the top of all our Burners and BBQs. It has a multi use firstly it supports the lid of the top of the burner allowing the smoke to pass around the lid. Secondly you can use it as a support for a frying pan wok or griddle allowing you to cook on the top of the burner. please specify which size you require . The price includes postage and packing in England.